cMT-SVR-200 has inherited all the key characteristics, including multi-display and remote monitoring. By running cMT Viewer App on a tablet, mobile phone, or PC, the operators can wirelessly monitor and control multiple cMT HMIs. Even when the operator is not on site, EasyAccess 2.0 makes remote monitoring possible while at the same time allows pass-through connection to a remote PLC. Without a touchscreen, cMT-SVR-200 can be installed inside a control cabinet, thus eliminating concerns over screen wear loss. But when a screen is needed, installing a cMT-iV5 will suffice. Compared to its predecessor, cMT-SVR-200 adopts wide input voltage range adaptable to varied power conditions. 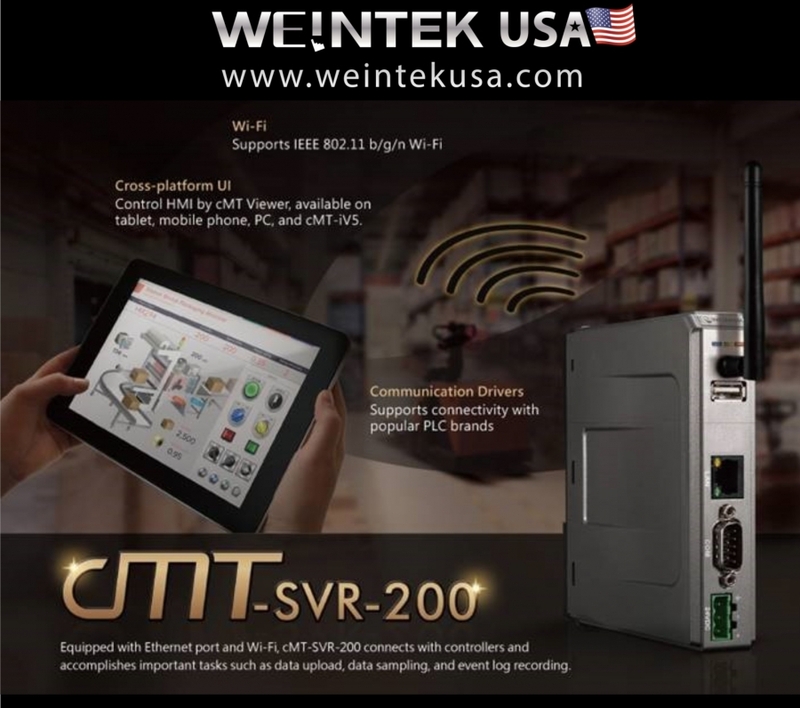 In addition, the Wi-Fi in cMT-SVR-200 supports 802.11b/g/n wireless communication standards and WPA/WPA2 security, enabling HMI to send/collect valuable data effectively, accurately and safely in harsh and complex industrial environment. Now with the release of cMT-SVR-200, users are provided with a new choice that will help overcome wiring obstacles, within the great cMT architecture.